Beautiful Pin-Ups, Vintage Finds and recipes and the fabulous Bernie Dexter!!! Out feb issue is sure to please! 2013 PLUS JAN FEB AND MARCH OF 2014 CALENDAR. HOT GIRLS TO KEEP YOU HAPPY ALL YEAR LONG! MILITARY TRIBUTE ISSUE PAYING TRIBUTE TO ALL THOSE WHO SERVE AND PROTECT US!! WE ARE EVER SO GRATEFUL!!! HOLIDAY ISSUE ENDING OFF OUR YEAR OF 2012 WITH FABULOUS PIN UPS, RECIPES AND VINTAGE FINDS! 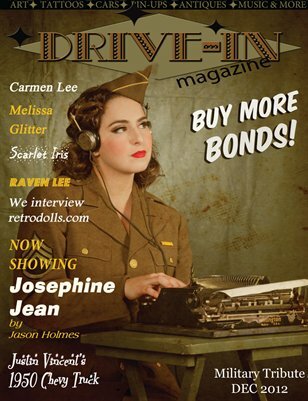 Drive-In Magazine Issue 8 Special Edition Girls with cars, planes, trucks and more!!! Pin-Up at its finest. Fabulous issue with the ever so wonderful Cherry Dollface as our covergirl. Beautiful ladies, vintage recipes, vintage finds and more! 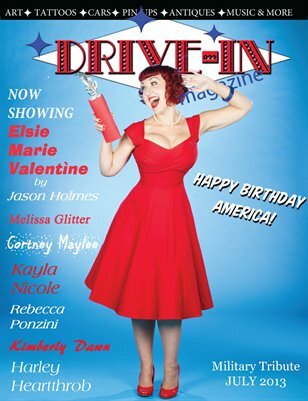 Issue 5 of Drive-In Magazine. Our 2012 calendar is now available!